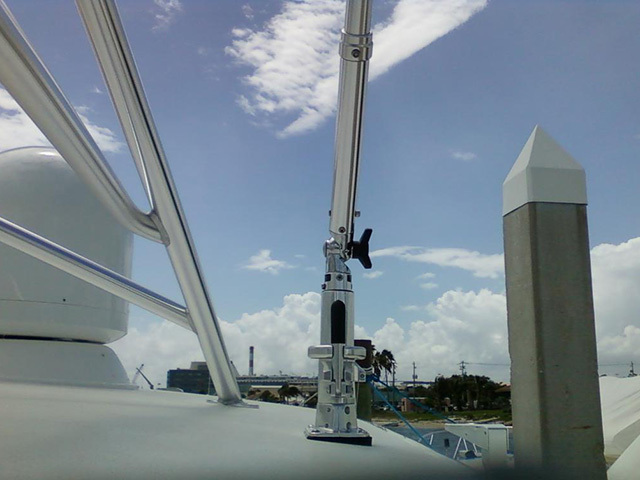 Add outriggers on your small boat with these easy steps..
Outriggers can be configured to fit any boat. Run with the outriggers up then lower the poles to fish. Here, T-top mounted outriggers put the lines higher off the water and keep the baits out of the prop wash. Photo by Ric Burnley. Custom outrigger mounts can be welded to the super structure for a solid base. Photo courtesy of Rupp Marine. Rupp's Stinger bases put the controls above the T-top and out of the way. Use a wedge to offset the slope of the T-top. Photo courtesy of Rupp Marine. 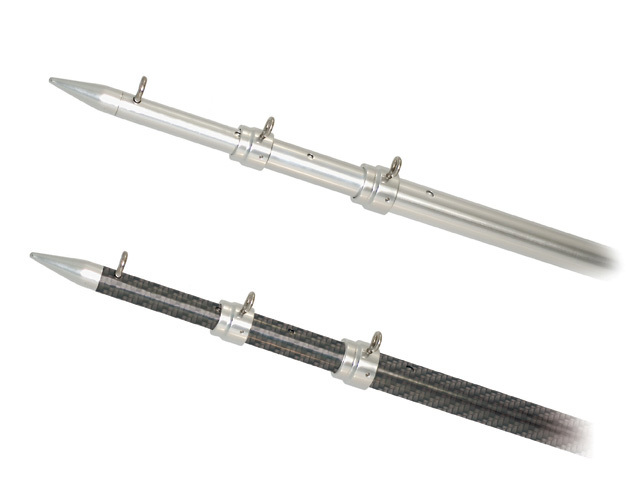 Carbon-fiber poles reduce weight without sacrificing strength. Aluminum outrigger poles offer a classic look and durable functionality. Controls for Rupp's Stinger base lie above the T-top and out of the way. To mount the base, the author drilled through the soft-top and metal mounting plate on the T-top. Photo by Ric Burnley. Loosen a knob on the outrigger control to raise and lower the poles. Keep the poles low and collapsed for travel. Raise the poles on the water to keep them out of the way and keep the baits swimming properly. You can attach the halyards to the T-top to keep them out of the way. 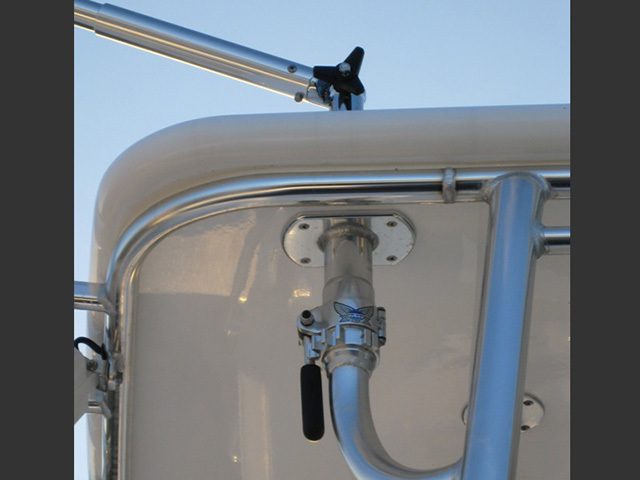 Be sure the halyards are easy to reach and operate. 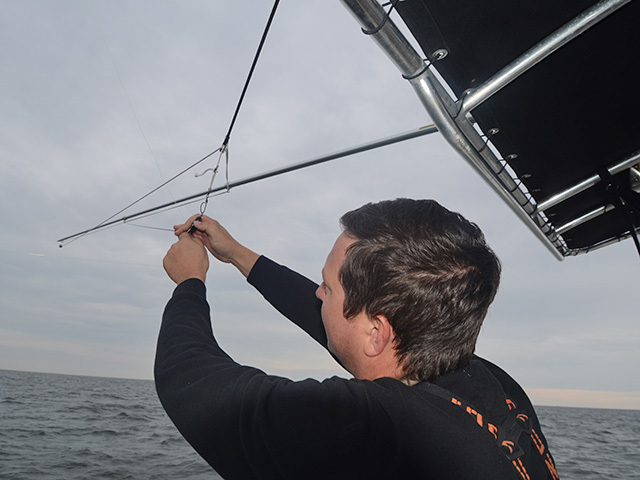 Use the shock cord to provide the right tension to the halyards. The lines should move easily but not slip or bounce around. 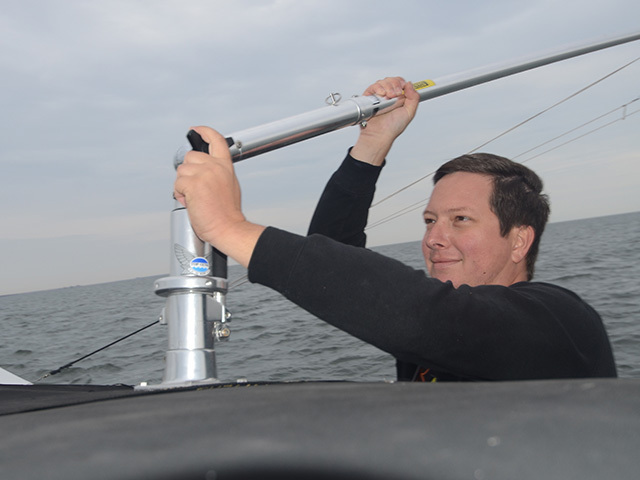 At the end of the day, retract the telescoping poles and wrap the excess halyard line around the control knob. A properly working trolling spread is a joy to behold. And the backbone of an effective trolling pattern is correctly rigged outriggers. Not only do outriggers keep the baits from tangling, they also elevate the lines so the lures or baits run on the surface. This is particularly important on a small boat. Pulling baits from outriggers spaces out the spread, creating a larger footprint in the water that will attract more fish. When gaffer dolphin showed up inshore two years ago, I attempted to target these fish by trolling naked ballyhoo from the rod holders on my 20-foot Jones Brothers center console. 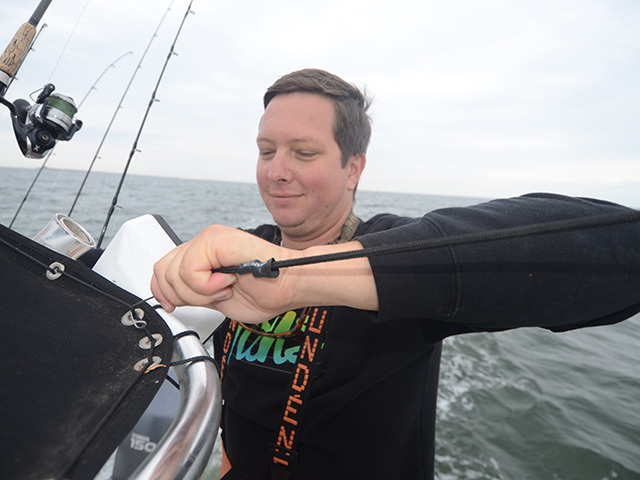 Without outriggers, my lines constantly tangled and I couldn’t get the baits out of the boat wake into clean water. We caught fish, but I knew we could do better. 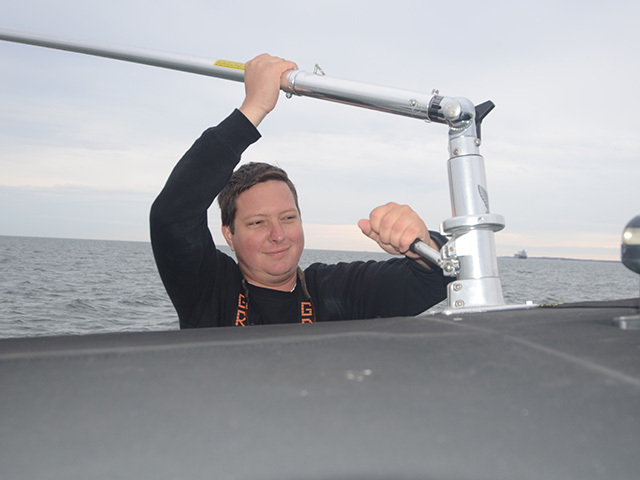 Over the winter, I contacted Darin Asher, technical service advisor at Rupp Marine, to learn more about setting my boat up with outriggers. Asher looked at pictures of the T-top on my boat to pick out the best outrigger bases. “Your boat is easy to reach the top of the T-top,” he said, recommending Rupp’s Stinger base to avoid drilling a huge hole in the soft top and metal mounting plate. 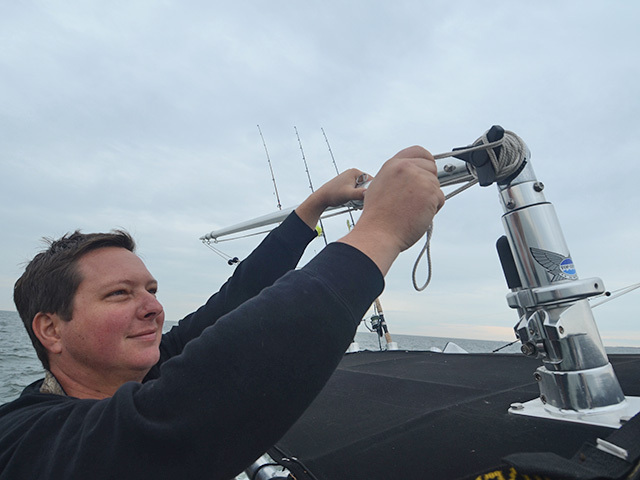 For larger boats with hard tops, Asher suggested TopGun bases that place the rigger control below the top. “Be sure to mount the base where it won’t interfere with the T-top supports or hit people in the head,” he added. Asher also suggested I take the T-top slope into account. Boats with more than a 10-degree drop should include an angled wedge to keep the riggers level. 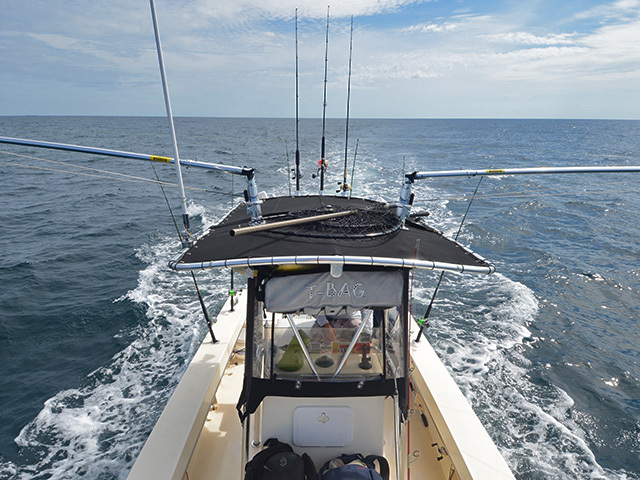 Boats that don’t have a T-top can go with gunwale or rod-holder outriggers, but T-top units keep the halyards out of the way so they don’t interfere with fishing. “They are there when you need them and out of the way when you don’t,” Asher said. To mount the bases, I drilled right through the soft top and the aluminum mounting plate on my T-top. I chose stainless steel bolts with lock nuts and added a washer to the bottom side of the mount. A template of the base made measuring holes easy, but I still measured everything and mocked it up about 100 times before drilling. Once the base is attached, adding the rigger poles is pretty easy. Rupp offers fixed rigger poles but I chose telescoping poles that I can collapse for easy stowage. Asher suggested poles no more than two-thirds the length of the boat. My 20-footer is best suited for 15-foot outrigger poles. The outrigger pole fixes into the base with a pin. I drilled a small hole through the base of the pole to match the hole in the mounting tube. Then you just slide the pole into the base and insert the pin. Once installed the poles extend with push-button locks. I keep the poles collapsed when running to the fishing grounds. The retracted poles don’t put as much pressure on the mounts when they’re bouncing around. The angle of the pole is adjusted by loosening a plastic knob and lowering or raising the pole. I keep the poles low when I’m running then lift one notch to fish. The poles are easier to lift and lower if they are angled out from the boat. The hardest part of the process was rigging the riggers with halyards and clips. Asher sent a rigging kit that included halyard line, Klicker clips and double pulley shock-cords. I chose to run two halyards for a short-rigger and a long-rigger. I ran the halyard line through the guides on the outrigger pole and the pulley. Then I slid a stopper ball over the halyard line and tied a 300-pound test snap swivel on each end of the line. I snapped a Klicker clip between the snap swivels. You can adjust the pressure of these clips so they open at the slightest tap from a billfish or tightened down to pull swimming plugs and heavy lures. Once adjusted, the clips maintain the proper tension without worry. I ran the short rigger halyard through the first two guides on the rigger pole alongside the long rigger halyard. The rest of the set-up is the same and the line runs through a double pulley. I attached the pulley to my hardtop so the lines are out of the way while I’m fishing but in reach when I need to work them. The hardest thing to figure out was keeping tension on the halyards when the outriggers are angled in to run or angled out to fish. I set up the halyards so they’re tight when the poles are angled out for trolling. When I bring the poles in (parallel to the boat) I move the pulley clip forward on my T-top to keep the halyard line tight. Payoff came quickly on the maiden voyage with my new outriggers. I could see the baits splash down the waves and run through the clear water. After trolling for a few minutes, the left long rigger clip popped and the line came tight as a 3-foot-long dolphin leapt into the air. Mission accomplished.